The only way to fix not blogging is to blog. Sometimes, I just create drafts thinking I will get to them, but that is never the case. And sometimes, I feel like I need to blog about all the important events in my life and in chronological order. Obviously, I don't have to do that. So I'm just going to conglomerate a bunch of thoughts together again. First and foremost, I have a Bachelor of Science in Electrical Engineering from the College of Engineering at Boston University. That's pretty exciting, right? This is one of my greatest achievements. I can't say it was extremely difficult, however I can say it did require a good amount of effort. And I seemed to have done it right, I think. Hindsight is 20/20. But I'm not at that point yet. But the reasons I think I did it right are because I have a wonderful internship at IDEO Chicago and I will be starting graduate school in the Fall with Smart Lighting Center at BU. Sounds pretty darn good to me. Yup, you read that right, I am in Chicago for an internship at IDEO. IDEO is one of those companies I admired as a youth so I cannot fully express how excited I am to be working for them. One of those "how the hell did I manage this" thing. People say not to question your good fortune, but I cannot not question it. My life seems to be going the right way. I haven't hit any major roadblocks. All I can say now is that I'm going to take full advantage of the opportunity. Do a lot of good work. And learn, learn, learn. Hopefully, I don't get too tired and I can return to school in the fall fresh of new ideas. This is coaster I designed for myself. 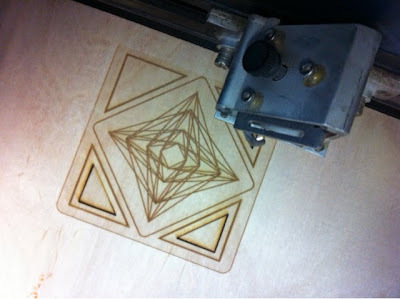 Also, my first time using a laser cutter. And a thought about "unplugging." unplug |ˌənˈpləg|verb (unplugs, unplugging, unplugged) [ with obj. ]1 disconnect (an electrical device) by removing its plug from a socket: she unplugged the fridge.• sever the connection between a peripheral device and a computer: the only thing you can do is to unplug the RJ45 | Why do I have to unplug the mouse to get the printer to work?2 remove an obstacle or blockage from: a procedure to unplug blocked arteries.3 [ no obj. ] informal relax by disengaging from normal activities:they've gone up to the cabin to unplug. This is the general definition found in the Apple dictionary. The OED only has the first definition for the verb unplug. But what interests me is the third definition. The informal "new" definition. No one said they were going to unplug themselves before the modern age. You unplug devices, wires, plugs. So what gives? It's so strange that this is a thing now. I am glued to my electronics. And I have to remember to unplug. So odd. It's as if gravity no longer pulled objects together and everyone is flying and we have to consciously remember to gravitate toward earth. Weird.